The Department of Public Health, Food Studies and Nutrition in Falk College wants to help Syracuse University and SUNY College of Environmental Science and Forestry students, faculty and staff, and members of the community at large, improve eating habits and promote general well-being by making healthy food choices. 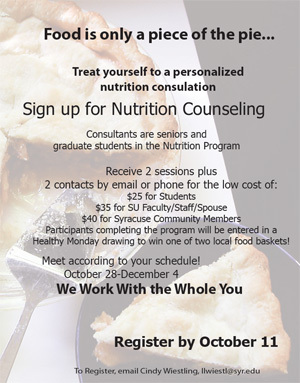 Seniors and graduate students in the nutrition science and dietetics program (supervised by registered dietitians), will provide accurate, thorough and confidential dietary consultation. The program is led by Tanya Horacek, associate professor of nutrition. The deadline to sign up to participate is Oct. 11. Consultation sessions are private and individualized, with flexible scheduling and locations. The series of four appointments (two in person and two via phone or e-mail) will address dietary issues, but is also lifestyle-oriented to ensure overall health. The cost for the program for SU/SUNY ESF students is $25. The cost for SU/SUNY ESF faculty, staff and their partners is $35. The fee for community members is $40. Participants who attend all consultation sessions and complete a brief survey about the program will be entered into a Healthy Monday drawing to win one of two local food baskets. To register, and for questions specific to the program, contact Cindy Wiestling at llwiestl@syr.edu. The first phase of the program includes completion of a medical and dietary survey, which will be e-mailed to participants upon registration for the program. The one-on-one appointments pair an individual with a nutrition consultant to formulate a reasonable and sustainable plan for improving dietary quality, which includes a detailed assessment of medical, dietary, weight, exercise and lifestyle factors. During this appointment, the nutrition consultant will provide detailed feedback regarding dietary quality and will help participants map out goals and a plan related to improved nutritional habits. Appointments will take place during October and November. The confidential program is meant strictly for disease prevention/health promotion and not medical nutrition therapy. If a participant is determined to have risks beyond the scope of this program, referrals will be made for a more appropriate service and the participation fee will be refunded.